I have completed twenty (20!) 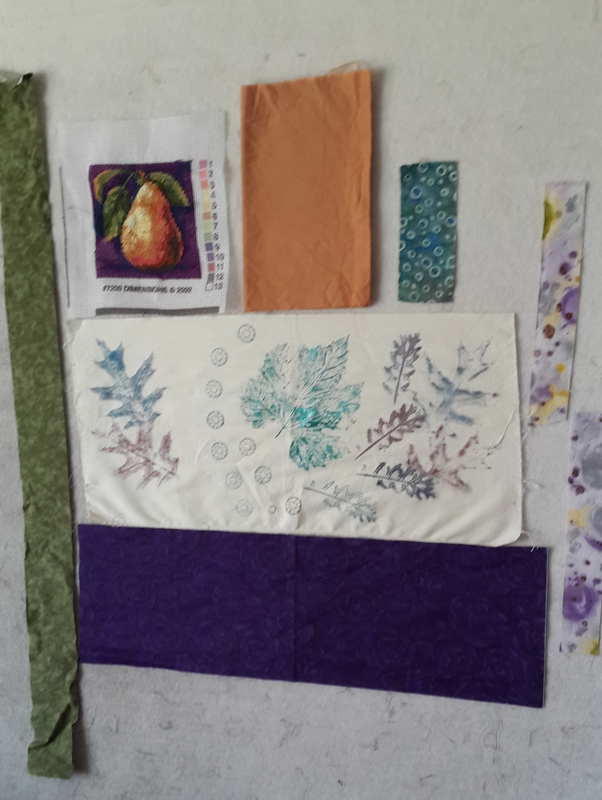 projects since beginning the Unfinished Quilt Challenge, with no real increase in storage space apparent in my sewing room. It seems that there are laws of scrap dynamics at play here. 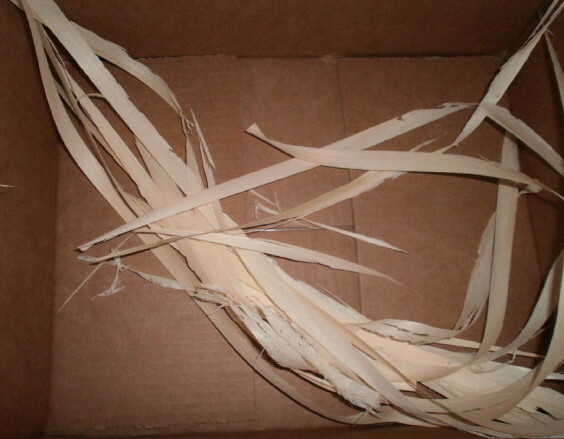 Scraps are the logical and inevitable result of creativity. 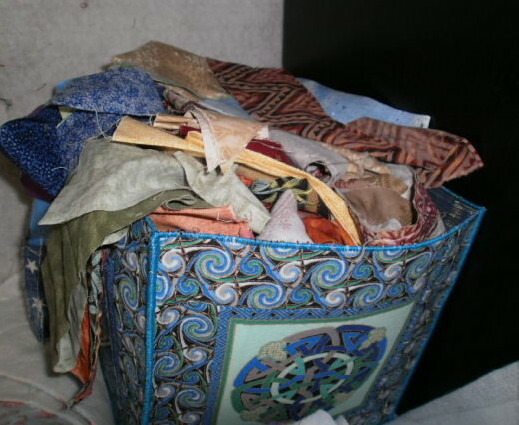 No matter how tidy your original stack of fabrics, it will always result in an unruly collection of leftover pieces (even if the project is completed). Since this is going to be your fate, embrace the mess. You can’t get rid of scraps on your own. 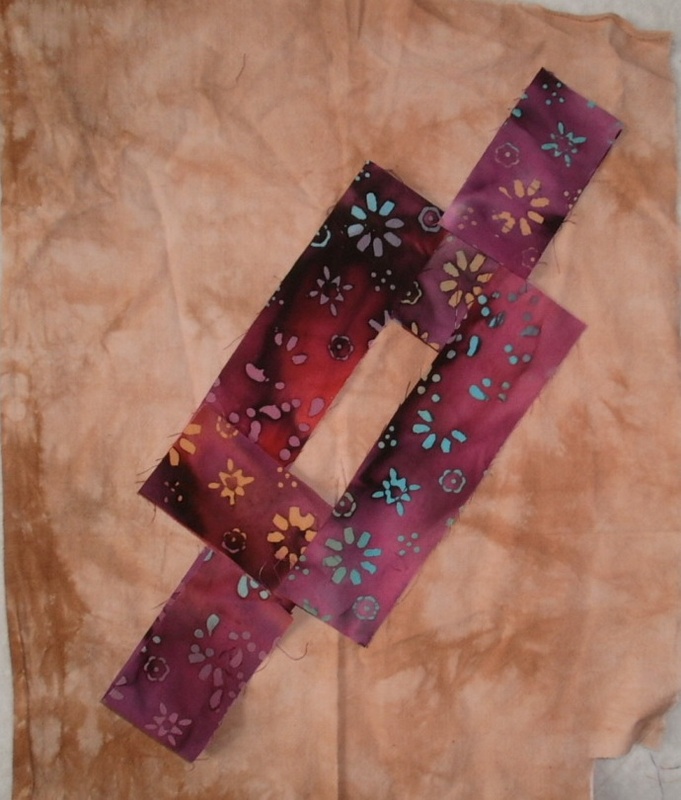 The picture above is the fourth top to come out of a collection of pink and brown fabrics that I figured would be used up in one quilt. The key here is to find someone or something to help. 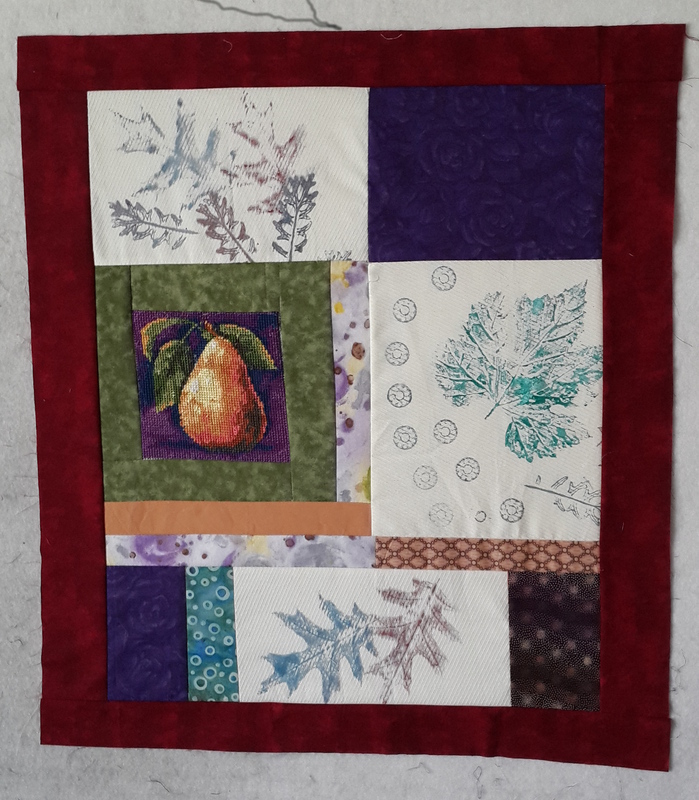 The Unfinished Quilt Challenge has encouraged me to use any and all leftovers in donation quilts. That has given me the courage to continue piecing tops and backs from collections that by all rights should be used up by now, and to tell the committee that distributes donation quilts that I will have several ready for them after the first of the year. Scraps and creativity exist in equilibrium. The more creative you are, the more scraps you have, or find. I thought I would be clever and use some scraps from other projects in this top. I thought I would clear out one scrap bag (I used maybe a quarter of a yard), and I found a forgotten bag of scraps tucked behind the one I was raiding. For me, the moral of the story is unclear. Perhaps one of you has a sure-fire way of getting rid of scraps? My plan to use scraps for my tea towel quilt is working. I pulled out all the odd blue remnants, cut them into 1 1/2” or 2 1/2” strips, and started sewing. The great thing about a scrap quilt is the more fabric you use, the less you notice the disparities. Country calicoes and ethnic prints? Cool. Formal versus funky stripes? No problem. Blues that don’t always play nice together? The flow keeps them from fighting. I decided I would try the same technique with the backing. My flannel collection is getting thin, but I bet I can piece together something interesting from this stack. This will be a couch quilt, something to huddle under on a cold winter day (yes, we get one or two of them in California). It might also be a conversation starter, although I’m well aware that when someone asks, “How did you come up with the idea?” they’re really asking, “Mercy, what were you thinking!” Doesn’t matter – my scrap pile is smaller, and I’m getting my projects finished. I prefer to make New Year’s projects rather than New Year’s resolutions, and this year’s big project just made itself known. My art quilt critique group started the exercises in Art Quilt Collage by Deborah Boschert. The latest assignment was in design basics. I had a few minutes and very little brainpower, so I knew I wouldn’t overthink things. I grabbed some scraps of fabric and batting. A long strip of batting and a piece of watery fabric became the beginning of a high horizon seascape. I decided to continue with the water theme, mainly because I unearthed a strip of trout fabric and a batting strip of the appropriate size. The next step was to experiment with grids, so I quilted the trout to the batting, cut out nine squares, and zig-zagged them together again. This is the back, showing the basic grid. I didn’t mind the back seams showing, but I wanted to cover the ones in front. Narrow strips zig-zagged in place did the trick, and I added some extra strips to enhance the grid. The best part about these exercises is that I really like using commercial print fabrics in my art quilts, but a lot of fiber art today is made from hand-dyes and solids. 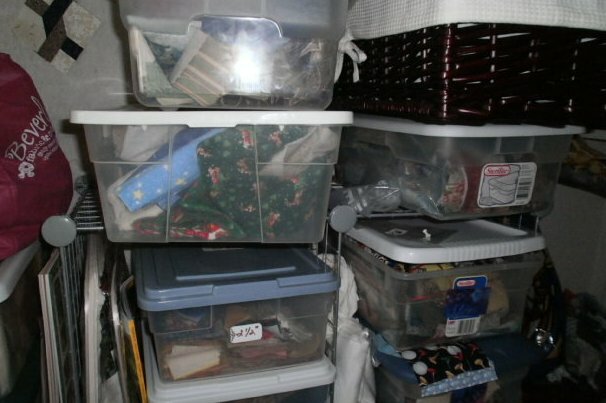 If I cut into my stash, I feel as if I must have a brilliant idea to complete. Since I’m only using leftovers, my ego investment is limited. If the project works, great; if not, at least I’ve reduced the size of the scrap pile. As it happens, I like what I’ve done so far, and have some ideas for embellishment that will turn these exercises into art. Someday. I’m still pondering options for a new handbag, so I made a gift bag instead. Last summer I bought a couple of gift bags at a quilt show. They sported 9-Patches fused onto a brown paper bag and embellished with a single button in the center square. The woman who made them said she had seen the idea somewhere else, so I can’t give proper credit for the technique. 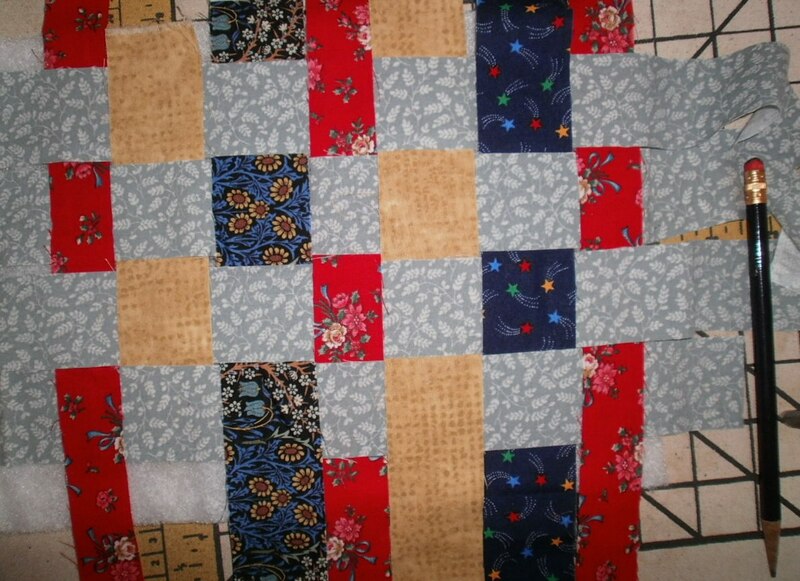 I thought about fusing a 9-Patch and decided I would be happier starting with simple strips. Heaven knows I have enough scrap strips around the sewing room. There really is nothing else to it – press the strips, fuse the strips, fuse the unit to the bag. The ribbon star is meant for scrap-booking or card-making and has a sticky pad on the back. I did make one other change. Instead of drawing a dotted line around the fused unit with a felt-tipped pen, I used nail polish. Since this was my first attempt, I used gold nail polish, which adds a subtle sheen more than a sharp line. The reason I am using nail polish is I have lots of it and don’t wear it any more. Of course, I never threw it out. Why would I throw it out when I could have it take up space for years and years until I discovered another use for it? These scraps sat on my design wall for months. I thought they might look nice together, but didn’t know what format to use. Art quilt? Craft project? Book cover? Tote bag? I decided to start sewing and hope a purpose presented itself. Purpose did not appear, but the need for more fabric did. Situations like this are why I have the scrap bin under the design wall. This is where I am now. It is finished enough to move off the design wall. I might embellish it. I might submit it to the Progressive Party for them to work some magic. I might put it in a very safe place and forget all it about. The universe played quite an April Fool’s joke. Last week I wrote about my fear of new projects. This week, I have another new project. That roar you hear isn’t thunder, it’s the universe laughing at me. My husband gave me these lovely wood shaving strips. They are so thin and flexible he thought I could sew through them. They came from the cabinet doors he is making. 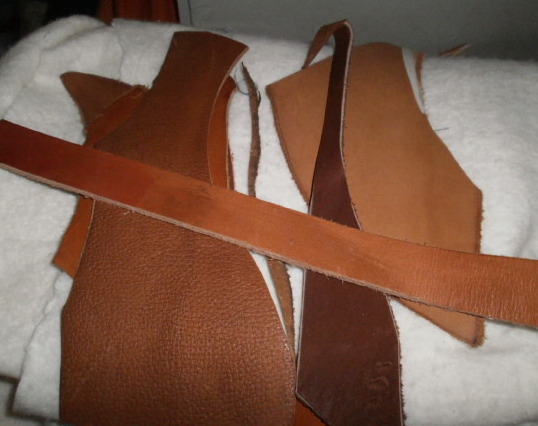 I’ve been saving a bag of leather scraps that he gave me at the end of another project a long time ago. I know these two will look fabulous together. How they’ll look fabulous – not a clue. 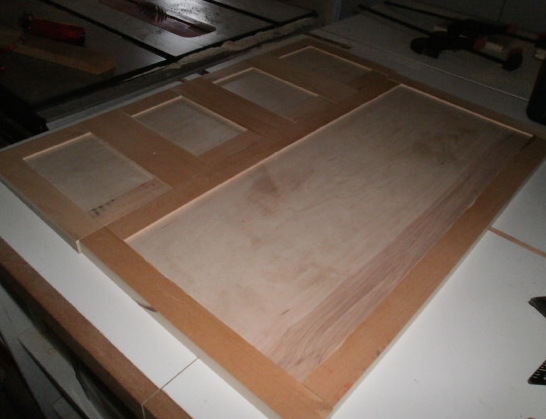 The first step in making scraps is to have a plan. I had a plan for the last two days, then stuff happened and I ended up with scraps of days. The people who created the kit I just finished also had a plan, a reasonably good plan, but I ended up with scraps anyway. 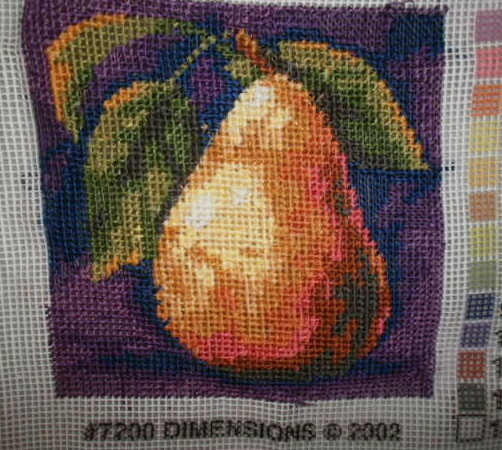 The kit for this lovely pear was included in one of the many embroidery grab bags I bought at a silent auction. I’ve been working on it while watching TV at night, and finally finished it. That’s the good news. 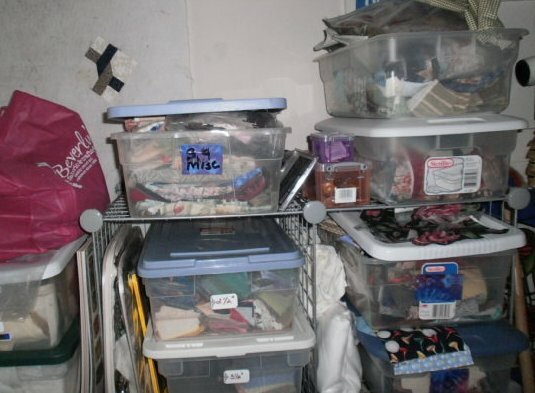 The not-so-good news for a craft supply hoarder is that the kit designers made sure there would be enough floss to finish the project no matter how incompetent the stitcher. This is beautiful floss, and I’m not about to toss it. I am, however, exceptionally lazy and I’m not about to wind it on spools and file it neatly. 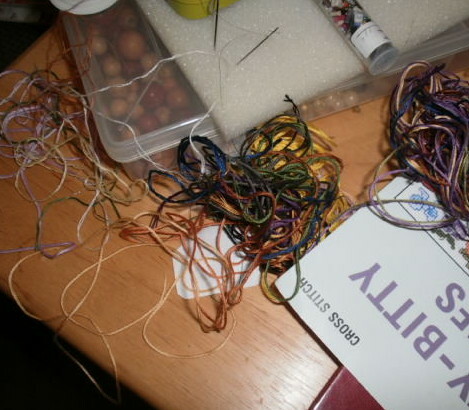 Instead, I’ve been trying to come up with odd projects (and the key word here really is odd) that will use up the floss. 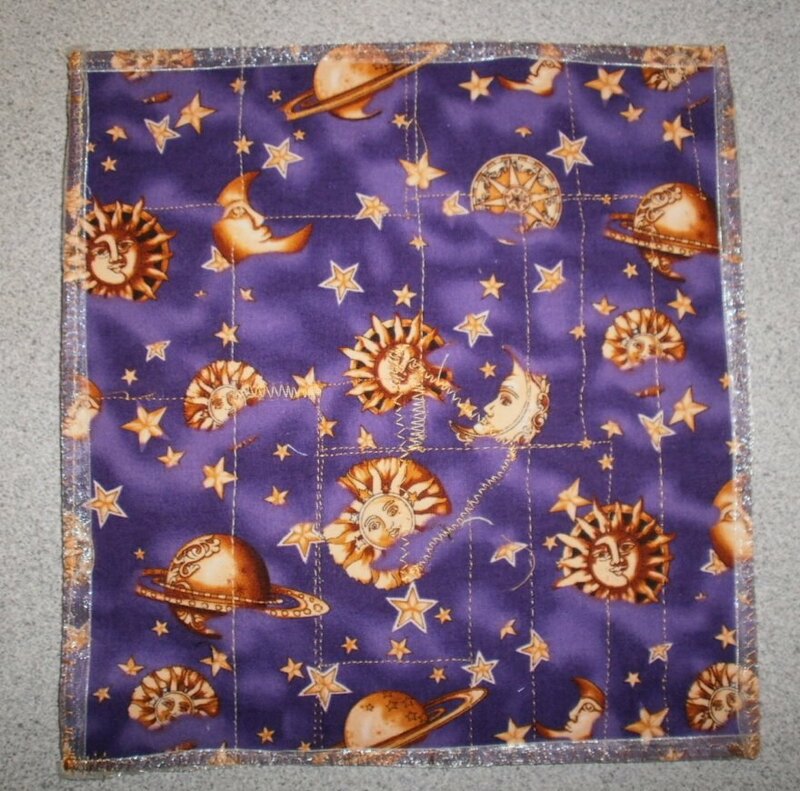 This will end up in my science fiction quilt series – just don’t ask me how or when. 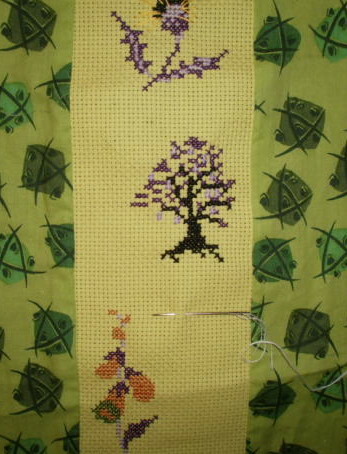 If I’m very lucky, I’ll be able to combine some of my quilting scraps with the cross-stitch, but I’m not holding my breath. I guess what I really need is the inspiration for a blog post titled Scraps and How to Get Rid of Them Without Actually Making Another Quilt. The nurse who drew my blood at my last donation gave me a gift. She made a different mark for the insertion site. Let me explain. I have teeny-tiny veins, and they’re hidden deep in my arm. When I donate blood, the nurse first has to pump up the pressure cuff to find a vein, then mark it carefully before swabbing down that patch of skin. All the other people have drawn four arrows pointing in one spot. 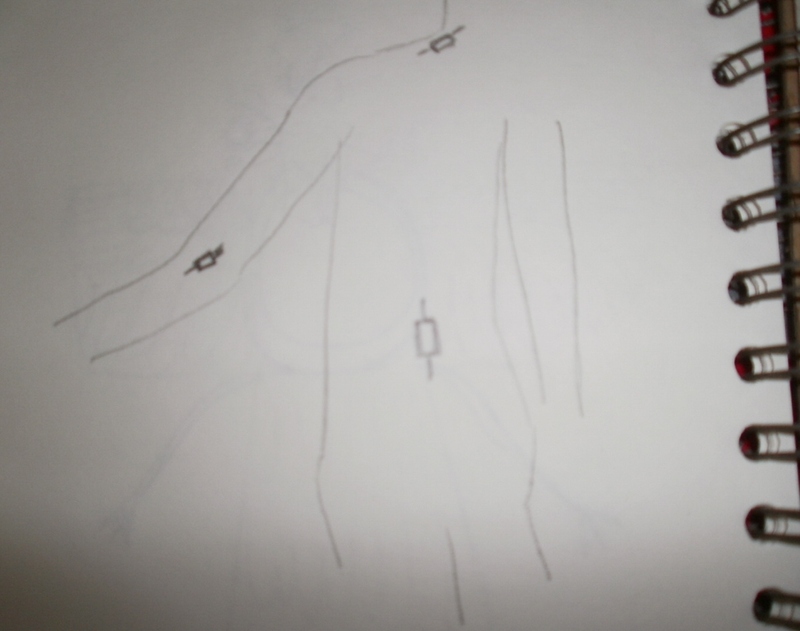 This time, the nurse drew a rectangle with lines on opposite ends marking the line of insertion for the needle. It was so cool, I knew it would make a great block. Looks like chain links, right? As I considered the block, I remembered an article I read about medical tattoos – temporary patches made from nanotubes to deliver medication. That brought to mind a scene in a medical bay I had written in The Chenille Ultimatum (part of the series with Ann Anastasio – Death By Chenille and When Chenille Is Not Enough). Although the heroine in that scene was being treated for minor bumps and bruises, I know there will be a bigger battle scene later in the book, and I could use medical tattoos that look like quilt blocks for the wounded. That brought to mind a project I have put aside temporarily about space Vikings. I could have permanent tattoos for those soldiers. When my soldiers are picked up after a battle, I could have the medics wrap them in quilts with matching patches that quickly diagnose the injuries and start repair work while the transport pods bring them to the medical ships. 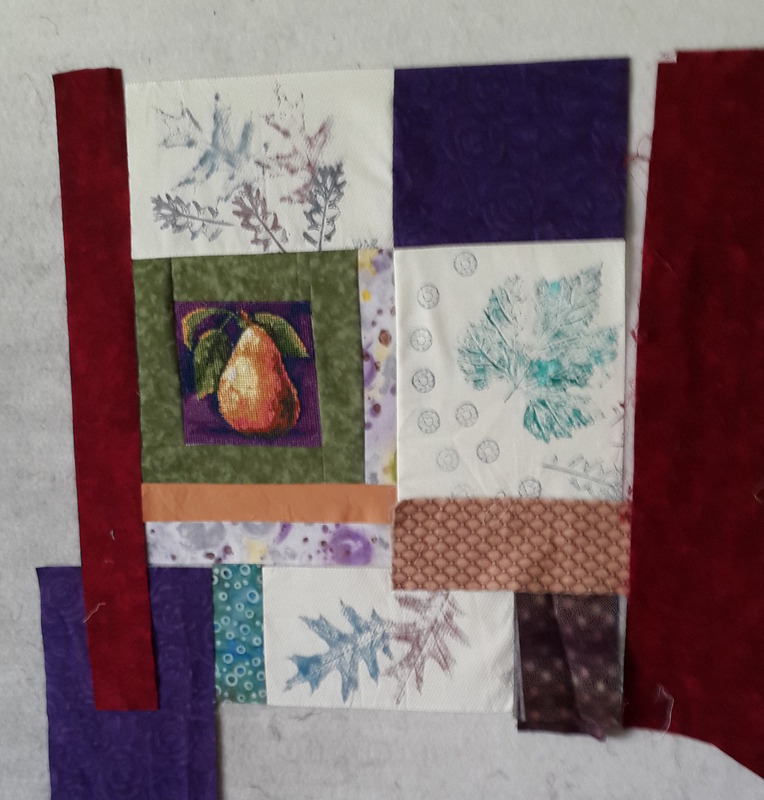 That brought me to my scrap bin to experiment with leftovers for a background for this quilt. Once I figure out what I want the patch to look like, I can embroider and quilt it sashiko style on the background, then insert some LED lights to make it really fancy. If there’s a chance to add some glitz to my life, I’m there. All of this background material for various projects, just because a clever nurse drew a different box on my skin. My daughter walked into the sewing room just as I tossed some scraps of yellow fabric into the trash bin. “You aren’t letting those go to waste, are you?” she asked. I thought I detected a note of glee in her voice, since she’s heard those words from me often enough over the years. I showed her four bins of scraps. She just said, “Wasteful.” She was grinning when she left the room. Although I left the scraps in the trash that night, the next morning I fished them out. They were pretty yellows, and deserved a better fate than the landfill. I found a backing and let guilt inspire art. I decided to make a small piece with only a few other yellow scraps from one of my bins. I used Pellon Decor instead of batting so that I could use my hot glue gun to attach some yellow beads that deserved a better fate than living in my bead box. I knew I would never use them if I had to sew them on, because most of them were odd shapes meant for jewelry, not quilts. Yes, the top bead isn’t an odd shape, but the one in the lower left corner is, and don’t get me started on the string of beads in the lower right corner. 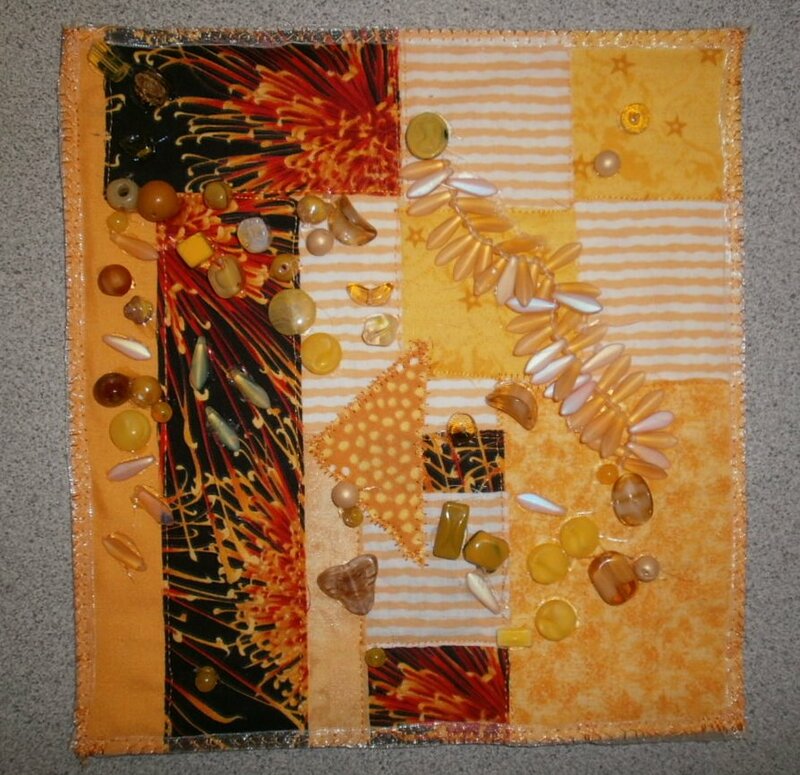 Since the solstice is nearly here, and the fabric was yellow, the piece is based on the theme of sunshine. Sometimes guilt can be a great motivator. I celebrated spring with another skirmish in the scrap wars. The dedicated scrap bins had long ago overflowed, so I replaced them with a large woven basket. 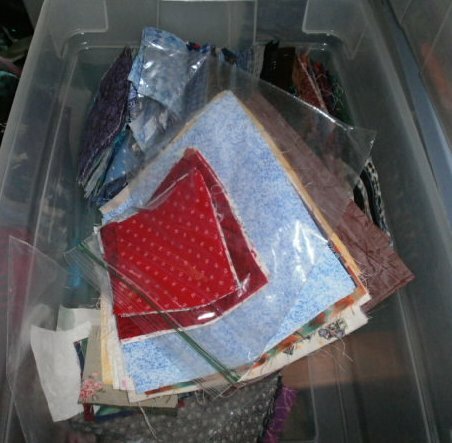 Then friends gifted me with lots of cut squares for kits for the prison program. 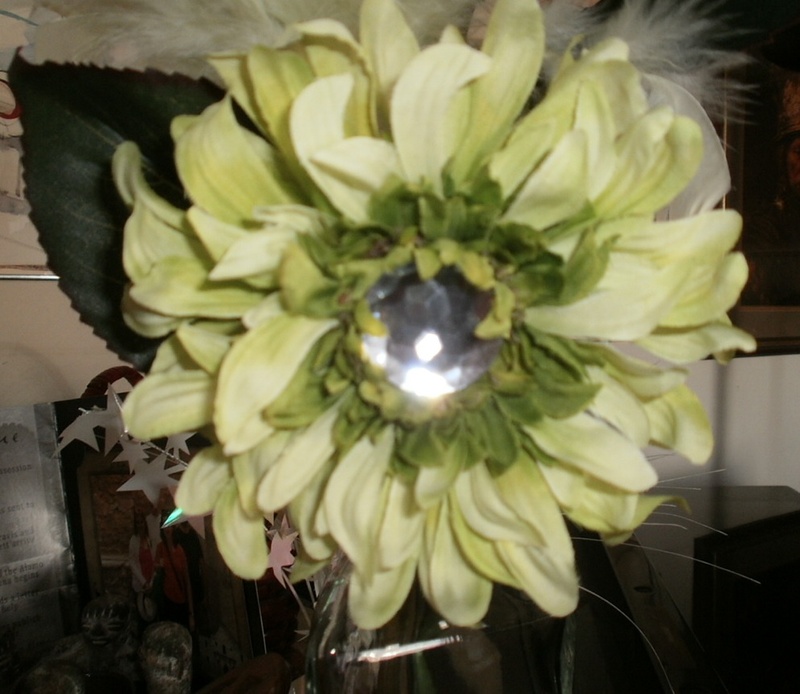 I vowed the next time there was a lull in the rhythm of creative chaos I would do some sorting. That day came over the weekend, when I was caught up with friendship group deadlines, had enough kits for the prison class to take a brief rest, and didn’t have enough brain power to start a project on my “some day I really want to make this” list. The sorting went well enough, but the real discovery was how much stuff I had tossed into the woven basket. It was worse than realizing you ate the entire bag of cookies while watching that silly TV movie, and you didn’t like either the cookies or the film! Having no brain power for creative thought worked to my advantage, since I didn’t have the energy to get bored cutting scraps. I worked until one of the family poked a head in the sewing room to ask about dinner, then returned to put things away. The woven basket is awaiting repurposing now, and I will use the clear(ish) bins to hold the scraps. They may fill up sooner, but knowing what I’m really squirreling away is essential to keeping up the effort of taming the piles.